Jim Darlington, President of Leisure Ponds, mapped a small pond in the St. Louis area for a residential Home Owners Association. The pond surveyed was approximately 0.8 acres and had shown warning signs of significant sedimentation. GPS Lake mapping was conducted on site to reveal the true lake depths of the ponds. In addition to the bathymetric survey, sedimentation depths were collected and a model of sedimentation levels was created to estimate the volume of sludge in the lake. 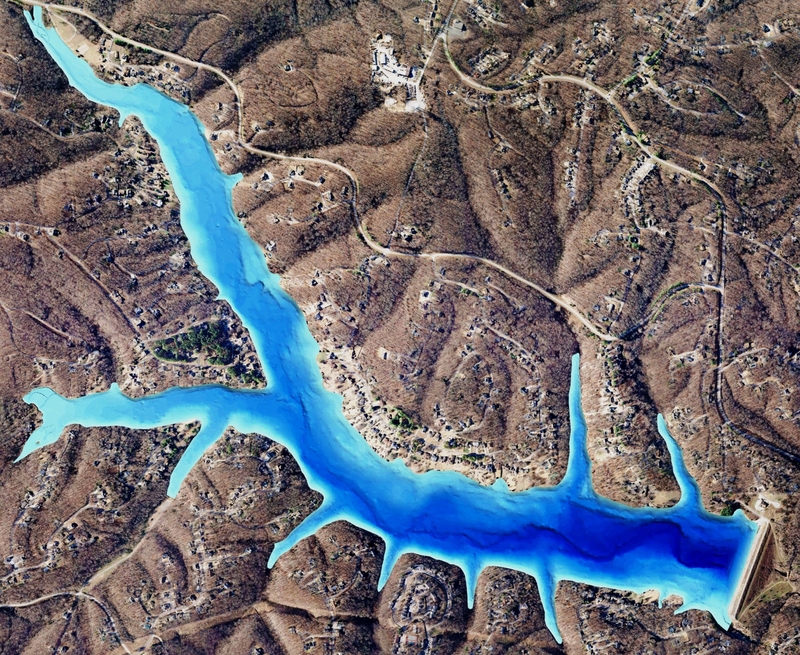 During the mapping process, the HOA found out that the middle of the lake had roughly 6 to 7 feet of sedimentation accumulation. This information provided the baseline depth profile needed for long-term sedimentation monitoring and dredging plans. 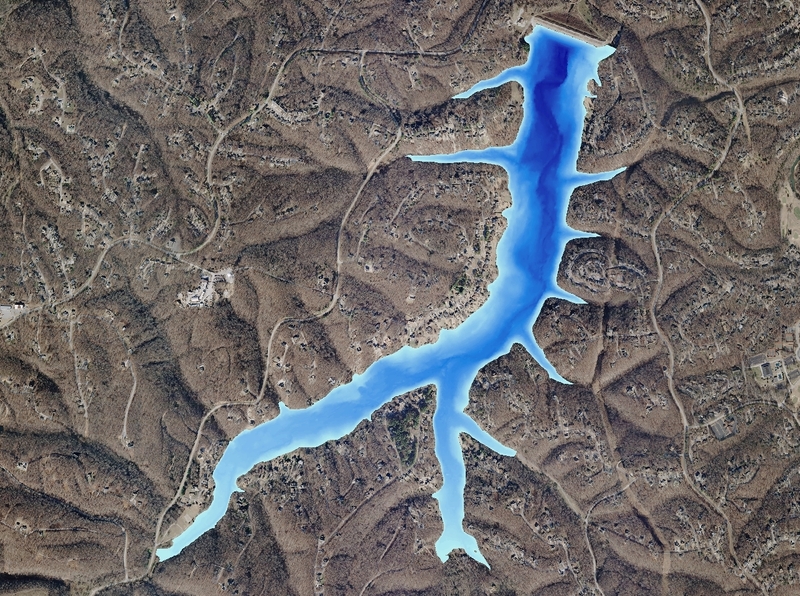 The mapping techniques utilized in this project allowed Leisure Ponds to accurately isolate areas of high sedimentation for removal and help lake managers budget accordingly. The association was able to properly communicate their goals with a dredging company and the sediment was removed according to plan. Upon completion of the pond dredging, Leisure Ponds charted the bottom of the lake to observe the improvements. Not only was the HOA able to verify the work had been completed properly, they now have a basemap to monitor sediment accumulation over time. 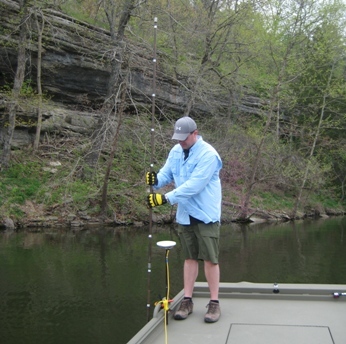 GPS bathymetric mapping is a powerful tool for assisting in management decisions. 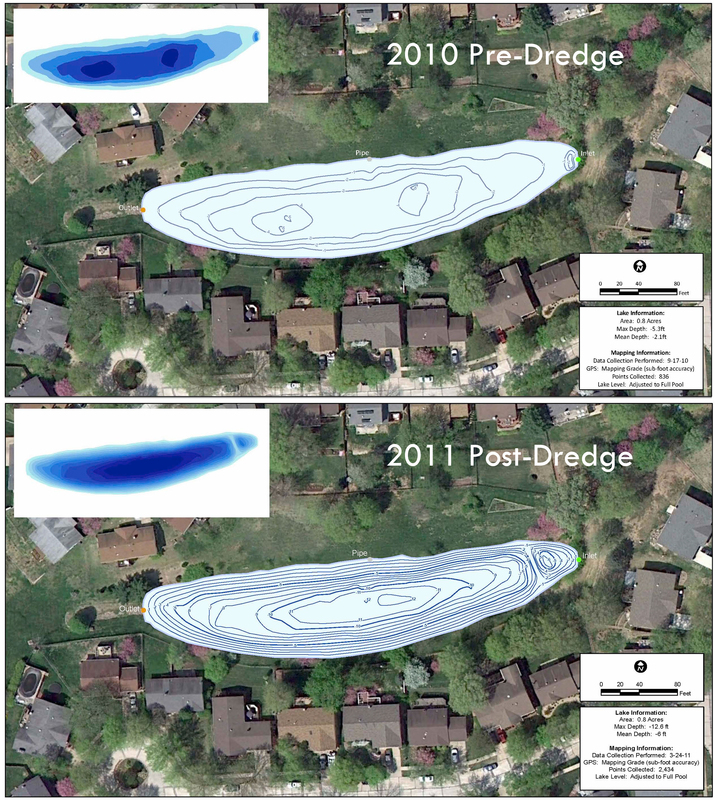 The pond was mapped before and after dredging. The owner verified the contractor removed the correct amount of material and the desired depth was acheived. The Mapping Network maps lakes throughout the entire year all across the nation. An accurate lake map provides the information needed to make the most of your aquatic resource. The Mapping Network provides the highest quality and is the most affordable bathymetric mapping system on the market today. If you are serious about maintaining a high-quality lake or pond, be sure you have the ability to make the best decisions, get your lake mapped by the professionals at The Mapping Network. This entry was posted in Lake Map, Sediment and tagged Absolute Natural Resources, Allied Biological, Aquatechnex, Aquatic Environmental Services, bathymetric lake map, Bathymetry, Dredging, Fishing, GIS, GPS, GPS Lake, GPS Map, Grow large bass, lake, Lake Management, Lake Map, Lake Mapping, Lake Survey, Land Mapping, map, New Jersey Lake, Pond, Pond Medics, Quality Lakes, Sediment, Sedimentation, southeastern pond management, Survey, Texas Dredging, Texas Lake, The Mapping Network, Trophy Bass, Trophy Fish, Virgina Lake Management on September 23, 2011 by Moderator. For lake associations or landowners undertaking a significant lake or pond renovation project, having an accurate map is essential for effective sediment removal. Dredging companies and their clients benefit from knowing where and how much sediment needs to be removed to achieve the desired results. This knowledge is made clear by having the lake professionally mapped. Trent Lewis with Pond Medics, Inc. (Prosper, TX) put this technology to use for a client, in this case a lake association in Dallas, Texas. The board of directors had a cove on the lake which had filled in with so much sediment that homeowners were unable to launch their boats. The association wanted to achieve a minimum depth of three feet to allow boats to travel through without worry. Originally bids were acquired by three contractors but the association became confused when the bids ranged from $170,000 to $210,000 for sediment removal. Mr. Lewis suggested a solution where the lake would be mapped and sediment measurements taken to create a comprehensive base map for the dredging companies to hone their bids. The result allowed the board of directors the ability to fine-tune the bids and the entire project was completed for $92,000. The lake was then re-mapped upon completion of the dredging to verify sediment had been removed. Mr Lewis said the board was extremely thankful for having the ability to accurately map their lake and as a result the association was able to save nearly 50% of the original cost for the dredging project. The Mapping Network maps lakes throughout the entire year all across the nation. An accurate lake map provides the information needed to make the most of your aquatic resource. The Mapping Network provides the highest quality and is the most affordable bathymetric mapping system on the market today. If you are serious about maintaining a high-quality lake or pond, be sure you have the ability to make the best decisions, get your lake mapped by the professionals at The Mapping Network. Give us a call or send an e-mail to find out more details. This entry was posted in Lake Map, Sediment and tagged Absolute Natural Resources, Allied Biological, Aquatechnex, Aquatic Environmental Services, bathymetric lake map, Bathymetry, Dredging, Fishing, GIS, GPS, GPS Lake, GPS Map, Grow large bass, lake, Lake Management, Lake Map, Lake Mapping, Lake Survey, Land Mapping, map, New Jersey Lake, Pond, Pond Medics, Quality Lakes, Sediment, Sedimentation, southeastern pond management, Survey, Texas Dredging, Texas Lake, The Mapping Network, Trophy Bass, Trophy Fish, Virgina Lake Management on September 21, 2011 by Moderator. Is GPS Lake Mapping For You? To fully enjoy your lake or pond it is essential to know the facts. Exact acreage, depths, and chemistry of your lake are critical factors for making the best management decisions. Armed with this knowledge you will be able to properly place structure, deliver appropriate stocking densities, select the correct fish species, apply the right amount of weed control, and of course gain a better idea where those bass may be hiding! This entry was posted in Lake Map, Sediment and tagged Absolute Natural Resources, Allied Biological, Aquatechnex, Aquatic Environmental Services, bathymetric lake map, Bathymetry, Dredging, Fishing, GIS, GPS, GPS Lake, GPS Map, Grow large bass, lake, Lake Management, Lake Map, Lake Mapping, Lake Survey, Land Mapping, map, New Jersey Lake, Pond, Pond Medics, Quality Lakes, Sediment, Sedimentation, southeastern pond management, Survey, Texas Dredging, Texas Lake, The Mapping Network, Trophy Bass, Trophy Fish, Virgina Lake Management on September 19, 2011 by Moderator. This entry was posted in Lake Map and tagged Absolute Natural Resources, Allied Biological, Aquatechnex, Aquatic Environmental Services, bathymetric lake map, Bathymetry, Dredging, Fishing, GIS, GPS, GPS Lake, GPS Map, Grow large bass, lake, Lake Management, Lake Map, Lake Mapping, Lake Survey, Land Mapping, map, New Jersey Lake, Pond, Pond Medics, Quality Lakes, Sediment, Sedimentation, southeastern pond management, Survey, Texas Dredging, Texas Lake, The Mapping Network, Trophy Bass, Trophy Fish, Virgina Lake Management on August 11, 2011 by Moderator. How Does a GPS Lake Map Benefit Owners? On the surface, a lake or pond seems serene and effortless to maintain, but under the surface is a complex, dynamic system requiring expert knowledge to produce a perfect balance. To fully enjoy your lake or pond it is essential to know the facts. Exact acreage, depths, and chemistry of your lake are critical factors for making the best management decisions. Armed with this knowledge you will be able to properly place structure, deliver appropriate stocking densities, select the correct fish species, apply the right amount of weed control, and of course gain a better idea where those bass may be hiding! The Mapping Network maps lakes throughout the entire year but typically the best time to map a lake is from fall until spring, while the weeds are down. An accurate lake map provides the information needed to make the most of your aquatic resource. The Mapping Network provides the highest quality and is the most affordable bathymetric mapping system on the market today. If you are serious about maintaining a high-quality lake or pond, be sure you have the ability to make the best decisions, get your lake mapped by the professionals at The Mapping Network. Give us a call or send an e-mail to find out more details. This entry was posted in Lake Map and tagged Absolute Natural Resources, Allied Biological, Aquatechnex, Aquatic Environmental Services, bathymetric lake map, Bathymetry, Dredging, Fishing, GIS, GPS, GPS Lake, GPS Map, lake, Lake Management, Lake Map, Lake Mapping, Lake Survey, Land Mapping, map, New Jersey Lake, Pond, Pond Medics, Quality Lakes, Sediment, Sedimentation, southeastern pond management, Survey, Texas Dredging, Texas Lake, The Mapping Network, Virgina Lake Management on January 12, 2011 by Moderator.